The band kids practice their "hurry up and wait." The Pioneer Days king and queen, in a buggy drawn by a matched pair of white horses, clatter up alongside the fire engine. She is relieved. The horses have been nervously watching the high school marching band, practicing nearby. Ford 550 brush trucks don’t bother them — they know trucks — but forty kids in shakos banging drums and playing horns are definitely Strange and Possibly Threatening. Their ears tilt forward and their eyes seem to bulge. For the first time since 2009, we have sent an engine down to participate in Florence’s parade. 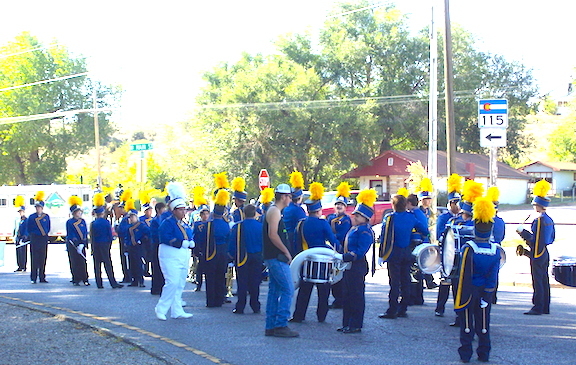 Are not all small-town parades about the same? I always flash back to my boyhood in Rapid City, although by comparison, this parade is short on Indians and U. S. Air Force units. There is, however, Fort Carson’s mounted color guard in their quasi-19th-century uniforms, and when the fire house siren sounds, they lead off. In a small fumble of parade-marshaling, someone has placed the second color guard with their piper right behind the high school band, so after a quick run-through of “Scotland the Brave” (hey, the vote was two days ago), the piper decides not to compete with the band kids’ music. Rounding the curve onto Main Street, we are briefly halted, while a Forest Service engine and the Fremont County sheriff’s wildland fire team pull in ahead of us — three more brush trucks. I let a short gap open up — we’re not them, we’re us. Up ahead, the band kids’ gold shakos waver in the heat waves rising from the fire trucks. “It’s the 'Your Tax Dollars at Work' parade,” I say to J., who is waving from the right-hand seat. Really, aside from two high school bands, Shriners on big motorcycles and tiny cars, and a some entries by local stores, there are few home-grown entries. The majority appear to be governmental (if you count schools too). That is troubling. Not even a classic-car club. It is over so fast, and we break formation on a side street, turning toward the highway back into the mountains, going home.